"The Volgograd Hotel", located in the historic, cultural and business center of the city, has been famous for its hospitality traditions since 1890. After renovation completed in 2015 the "Volgograd Hotel" satisfies the highest international standards. Unique solutions in the interior design, style and elegance combined with the atmosphere of comfort and peacefulness will ensure unforgettable experience and aesthetic enjoyment during the stay at the hotel. Hotel offers rooms of different categories and comfort: from cozy twins and comfortable studios to exquisite and luxurious suites. Each Suite is unique and has its original design. The classic interior design worked out to the last detail meets the highest international standards and provides harmony for productive work and excellent rest. All hotel rooms are equipped with Italian wood furniture, comfortable wide beds, high-speed Wi-Fi, multi-channel HD-TV, central air conditioning systems with individual remote control in each room, mini-bars and electronic safes. 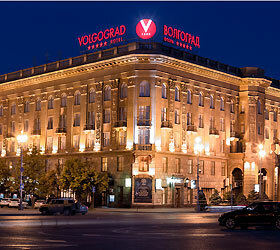 The "Volgograd Hotel" is a perfect venue for various events, we offer our guests. 4 business grounds, equipped with up-to-date devices. "Moliere Restaurant", located on the first floor of the Volgograd Hotel, invites you to taste Russian and European dishes specially prepared by the Chef. Every morning the restaurant serves breakfast with a rich choice of snacks, fresh bakery and superb coffee. Guests are also invited to enjoy the relaxing atmosphere of Biarritz Beauty Resort. The unique spa procedures, cosmetology, hairdressing services and professional approach will give you a lot of pleasure and positive emotions.